Contains our #7275 tripod, #7285 60’, 3-way SRL and mounting bracket. Also includes #7280 tripod bag and #7282 equipment bag for storage and transport. 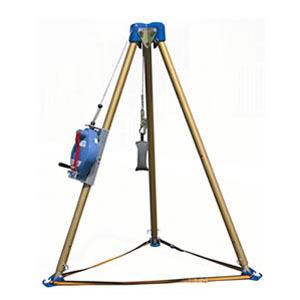 •#7275 Tripod is adjustable from 6’ to 11’ in height, is constructed with rugged, light-weight aluminum and features and integral stainless steel pulley. •#7285 3-way SRL is features CNC machined housing and drum, with rugged bronze ratchet center, pressure plate and pawls. Also features an aluminum winch gear and arm for retrieval and rescue. Uses the DuoTech load-indicating snap hook. •#7280 and #7282 bags are constructed with reinforced nylon fabric and are highly resistant to weather, tears and abrasion.